LeRoy Township was named for LeRoy, New York, the town from which many of its settlers had emigrated. LeRoy Township was originally named Chesterfield when the Connecticut Western Reserve was surveyed in 1797. Girdled Road was the first road cut through the Reserve, running between Pennsylvania and Cleveland, Ohio, built in 1797 to bring settlers into the area. The first settlement was made by Paul and Elijah Clapp. Many of the roads in the township were named for these early settlers – Balch, Blair, Brockway, Callow, Chadwick, Ford, Huntoon, Kniffen, Paine, Proctor, Seeley, Sumner, Taylor, Trask, Valentine, and Vrooman. Johnny Appleseed is believed to have traveled through the Township planting seeds along the creeks and river banks. Industrial centers began with the building of Hendrick Paine’s Sawmill and Forge. Hendrick Paine was from the family for which Painesville was named. A tannery, wagon shop, turning lathe and shoe shop stood nearby, running off the water power of Paine Creek. Bog iron was also in abundance so foundries were built in Paine’s Hollow. 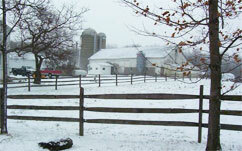 Established in 1820, agriculture still plays an integral part in the life and community of LeRoy. By 1820, the township name was changed to LeRoy Township, Geauga County. In 1840, it slightly changed again to LeRoy Township, Lake County. LeRoy was also home to the last covered bridge in Lake County, but unfortunately it was torn down in 1952. Agriculture has been a major industry in the township since it was founded. In the 1830s and 1840s, with the development of the Erie Canal system and better roads, crops became a major export along with cheese made from excess milk. LeRoy sent 40 men to serve in the Civil War under General George McClellan. Many historic homes, schools, churches and other buildings within the township still stand as a tribute to the pioneer families who tamed the wilderness in preparation for future generations. Today, according to the 2010 Census, there are approximately 3,253 residents living within the 25 square miles of LeRoy Township. This is a 4.2% increase from the 2000 Census. Get Updates from LeRoy Twp.